A fifty-seven minute video documentary made in Provincetown about LIVING with AIDS. Produced and directed by Roberta Pyzel. Shooting Stars is an intimate portrait of eight men in group therapy. With candidness and courage, humor and love for each other, they reveal dimensions of AIDS at its most intense levels, as well as its effect on their basic day-to-day lives. 2006© Act II Productions, Inc. 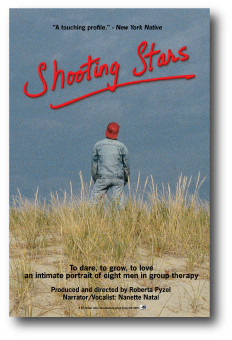 Shooting Stars moves you so deeply into these men’s souls, the barriers between gay and straight, health and disease are broken down. Shooting Stars challenges and inspires all of us to examine the precious gift of life. It draws the viewer into the circle of heroic humanness as it really is: frightened, vulnerable, mortal, but also deeply powerful and utterly beautiful.